Update: Thanks to the unlocked Stretch Goals, NINE free content Add-Ons will be released for use in MapForge, providing for an awesome "Starter Set" (for backers and non-backers alike). For details about these free Add-Ons, click here and here. Edit: Map Alchemists has now donated a 10th free Add-On. IF YOU'RE IN A HURRY, CLICK HERE FOR A QUICK RUNDOWN OF WHAT YOU CAN GET AT THE VARIOUS PLEDGE LEVELS. 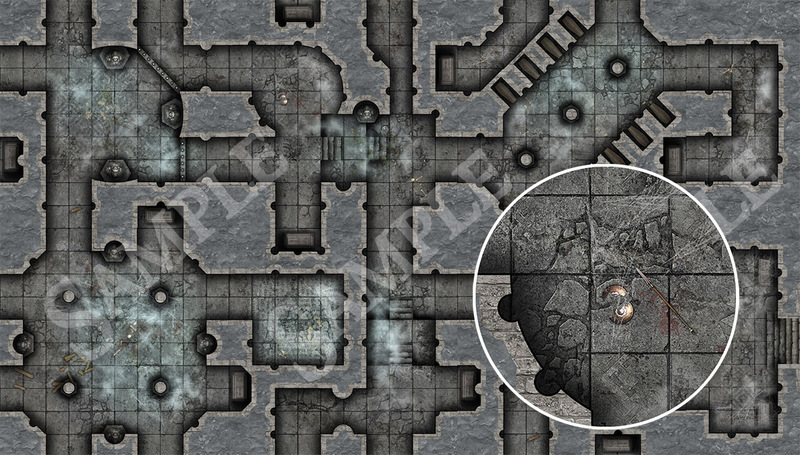 Have you always wanted to make your own slick-looking full-color battlemaps, but just don’t have the time or patience to learn to use a sophisticated image editing application like Photoshop or Gimp? Or perhaps you tried anyway but in the end you ran away screaming in frustration because you found it too difficult and/or time-consuming? Have you tried existing mapping software and been frustrated with the learning curve, the cost, the interface, and/or been disappointed by the results? If the answer to any or all of those questions is “yes”, then my brand new MapForge application is probably just what you’ve been searching for (and possibly waiting for for years). What will make MapForge special? The goal is to make MapForge really easy to use, and for a user to be able to start making maps on Day 1 without even bothering to read the User Manual. And by extension, to never feel like you need to re-learn the software even if it’s been many months since you last used it. Make your maps using top-notch professional Add-On content, or using your own content, or a mix of both. I’m making the software itself very affordable, so that you’ll have plenty of money left over to purchase a bunch of Add-Ons. Although it’s primarily intended for creating battlemaps (in any genre), the program will provide enough flexibility that, given the right content, you’ll also be able to create other types of maps, ranging from area maps to deep space. 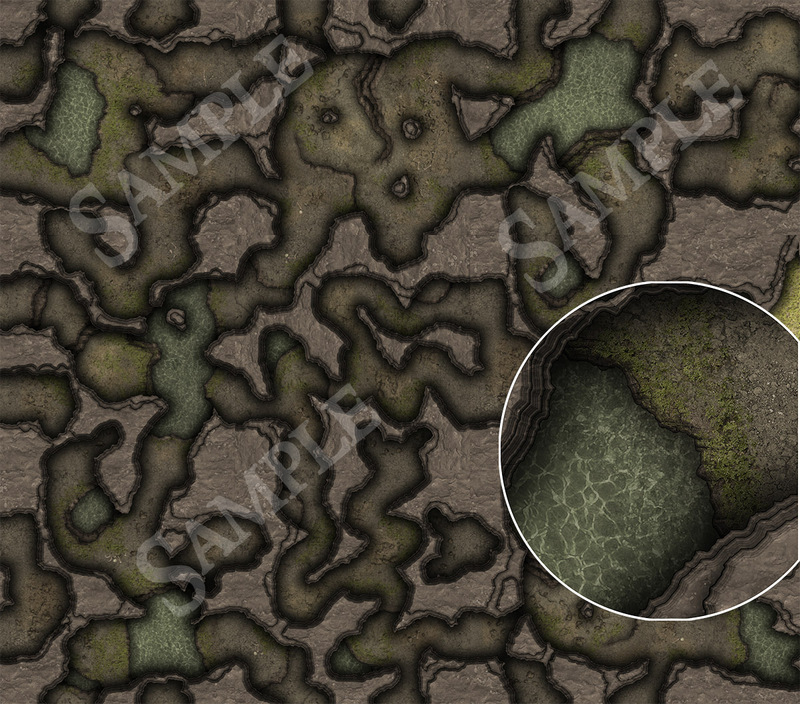 You can use the program to make high-resolution maps for printing, or lower- resolution maps for use in your favorite virtual tabletop software. The user interface for MapForge is thematically generic, but very attractive and modern. And it should appeal to you whether you’re the type who prefers to click on buttons and choose menu commands to get things done, or of you’re the power-user type who likes to use hotkeys to get things done that much quicker. Whether you’re a Windows user or a Mac user, MapForge has you covered. And if you have a MapForge license and someday decide to switch platforms, you can just request a new license code for the new operating system, free of charge. The output is crisp, detailed, and (optionally) high-resolution. MapForge will help you unleash your creativity. It’s not intended just for the artistically or technically gifted. It will allow anyone, regardless of their art skills or technical skills (or lack thereof), to create gorgeous, detailed battlemaps. With MapForge, you’ll be able to produce Photoshop-like effects such as bevels, drop-shadows, strokes, glows, blurs, and color adjustments without the steep learning curve that producing such effects normally requires. You’ll be able to use MapForge to make nice maps even if you haven’t purchased a license. Even use free and commercial Add-Ons without a license (though commercial Add-Ons will require registration). I’m confident that MapForge will earn a place in your mapping toolbox, and I’m optimistic that you’ll find it so useful that you will get a license eventually, in order to unlock the software’s full potential. With MapForge, I want to help GMs reduce their session prep time, not increase it. You shouldn’t have to spend several hours or even days creating a decent map for your game session. Using keyword searches and tags, you’ll find that elusive content you’re searching for in no time. My goal with MapForge is to enable you to whip up a great map in under an hour. Sometimes even two maps. And the most important element of all...FUN! Other map-making programs on the market can be a chore to use. It just feels too much like work. MapForge intends to make map-making FUN! Because if you aren’t having fun, you’re doing it wrong. The initial inspiration for this project came from using commercial mapping tiles for tabletop RPGs. 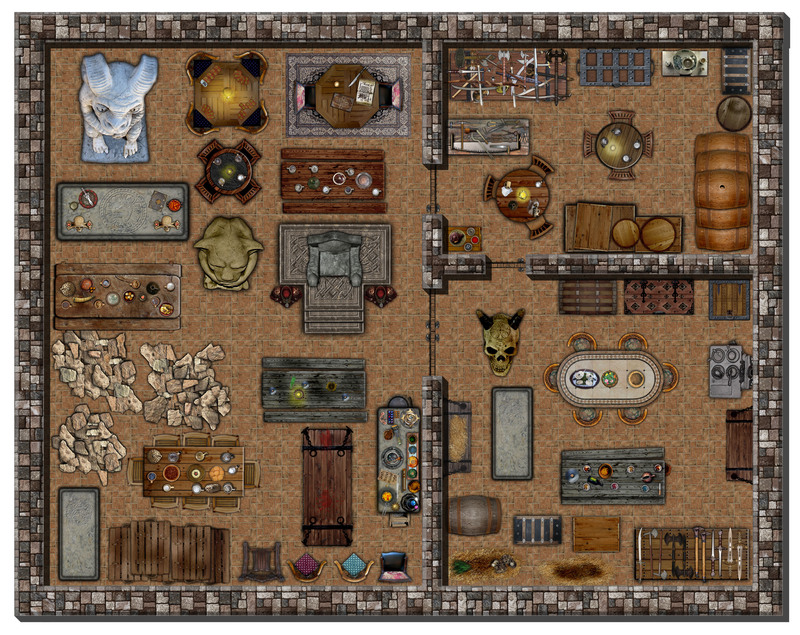 I found that the tiles themselves looked fantastic, but that the actual act of putting together a map layout, particularly for large layouts, was painstaking and rather tedious, even though I happen to be well-versed with a professional image editing program (Photoshop). GMs who want to print out map tiles that they purchase online or create themselves aren't the only ones affected by this "technical barrier to entry". Many people nowadays use virtual tabletop (VTT) software to play RPGs remotely, but VTTs are far from optimal map-making tools. They can be wonderful for having a few objects on the map that the players can interact with, but crafting entire map layouts from dozens or even hundreds of map elements is hardly their forte, and the time and effort required to do so would be inordinate. So I decided to create an easy-to-use computer program that would be the best possible tool I could dream up for the task of stitching together pre-made map tiles and and then populating them with decorative elements (e.g., furniture, treasure, debris, etc.) to suit a GM's particular needs. I'm calling the program MapForge. It is intended to allow anyone, regardless of their art skills (or lack thereof), to create gorgeous, hi-resolution battlemaps. MapForge is for any GM who wants to create a drool-worthy tactical-scale battlemap for any genre of RPG. It's also suitable for tabletop miniature games and wargames. Have you tried other mapping software and been frustrated with the learning curve and/or the results? That may be because the software tried to be too many things, and ended up not excelling at any one thing. • MapForge is not a general-purpose mapping app; you probably won't be using it to map out continents or entire worlds. It’s narrower in scope, focusing on tile-based and grid-based mapping at tactical combat scale (typically 1” = 5 ft., or 1 hex = 3 feet). • MapForge is not a general-purpose paint program, nor a CAD program. It’s more of a layout and design tool, intended for anyone to use, not just the artistically or technically gifted. • MapForge is also not just a simple “texture-stamping” program. Some of the planned features are geared towards producing Photoshop-like effects without the steep learning curve that producing such effects normally requires. The software will allow you to create maps by drawing rooms and corridors with straightforward drawing tools (with optional snap-to-grid functionality) and then applying "styles" to the walls and floors, including special effects like bevels, glows, strokes, blurs, and drop shadows, and (optionally) textures (e.g. stone, brick, cement, cobblestones, etc.). Some "general purpose" styles will come included (pre-configured) with the app, while other styles you will create or tweak yourself to achieve a very specific look. To ensure that great content would be available for use in the program, I formed an alliance with some of my favorite content creators in the field of mapmaking for RPGs. All of them are A-list artists who are well known and respected in the map-making community. They, too, saw the need for such a program, and decided to add their support. Collectively, their published work comprises a vast library of top-notch content that should cover the indoor and outdoor battlemap needs of most RPGs. The bulk of the proceeds from Add-On sales will go to the artists. But if we can collectively show them that the added convenience of the MapForge Add-On format will earn them more sales, it will validate one of the program's principal reasons for existing. IMPORTANT! All content Add-Ons are strictly for "Personal Use Only" EXCEPT those that are clearly marked as approved for publishing or commercial use (there are 6 such Add-Ons listed on this page, and another 3 free Add-Ons mentioned in the Updates). Pledging at the "Publisher/Commercial" pledge level does NOT give you the right to use other Add-Ons in commercial or published projects. Preview images for most of these Add-Ons can be seen here. All Dungeon Arts Add-Ons are 200 dpi resolution unless otherwise noted. Click here to see preview images. Add $5 to your pledge if you would like to use MapForge on a 2nd computer that you own. This is only for backers who are getting a MapForge license AND/OR paid content Add-Ons. See Update #9 for details. This one-time setup fee is a flat rate, and covers all Add-Ons you get now or in the future. It is being offered so that no one has to buy a 2nd license for themselves or purchase a 2nd copy of their Add-Ons. You may NOT use this allowance to permit someone else the use of your paid Add-Ons. Add $25 to your pledge (at any pledge level) to get an additional MapForge license for a friend. When the email survey goes out at the end if this campaign, be sure to include your friend's email address so that I can get them their license code. You can even order more than one license to gift, if you desire. Note that any content Add-Ons that you get for yourself will not also be applied to your friend's license. As MapForge's userbase grows, I fully expect that additional Add-Ons will be developed and released in the future, both from the above content providers and from others that will want to service the MapForge community. The above selection of Add-Ons is just the "first wave", but should be more than enough for the time-being. If by chance you have already purchased some of the above content in the original PDF or PNG format, you should be able to use it in MapForge, albeit without some of the added convenience provided by the Add-On format. Some of the content providers might be willing to allow free registration of the respective Add-Ons to customers who've already purchased their content in its original format and can show proof of purchase. I want the MapForge software to be extremely versatile and user friendly, something you can use without first having to read a dense user manual, or resume using without a hitch even if it's been many months since you last used the program. The user interface will be modern, gorgeous (despite being thematically generic), and will look the same regardless of whether you are running the app on Windows or on macOS. Should you happen to switch operating systems someday, you will be able to continue using MapForge without missing a beat. I also want MapForge to offer a free level of use, so that it’s usable by anyone, even those who have not purchased a license (albeit with a reduced featureset and a few other limitations). This should allow the MapForge userbase to grow very rapidly, which in turn will make the platform more appealing to content publishers, who may want to make their wares available in MapForge. In addition to using content from pre-packaged Add-Ons, MapForge will also allow you to use your own artwork (either created by you, or downloaded from elsewhere, such as the Dundjinni user forums or rpgmapshare.com). I don't expect too many people to back this project on faith alone. Many of you have likely been disappointed by prior map-making software, so a healthy degree of skepticism is expected. That is why I have put together a MapForge demo/prototype, which you can download and try out for yourself, in order to evaluate it and take the program for a short spin to see if this is going to be the program you want/expect it to be. A great many features have yet to be implemented (that's what this crowdfunding campaign is for, after all! ), but there is enough there for you to evaluate the proposed user interface, the planned featureset, the performance, and the ease of use. A few bugs are to be expected, as this has not seen general release until now. If necessary, I will update the prototype during this campaign to iron out any show-stopping issues encountered. Here is a video that walks you through most of the features in the MapForge prototype. You should probably watch this even if you download the prototype demo, since this explains things you might otherwise miss. IMPORTANT! Please do not misinterpret what you see in the prototype app or in the video. Just because it only shows maps being assembled from tiles, that does not mean that it is the only thing the final MapForge application will do. MapForge will be a full-fledged map-making program, offering several different methods for creating maps, and those methods can be used individually, or in conjunction. If you prefer to make your own maps from scratch, that will be possible, too. The prototype and the video both show a paid Add-On being used, which is not included with the base software. If you want that particular Add-On, it's called "Dark Crypts", by Black Scrolls Games. 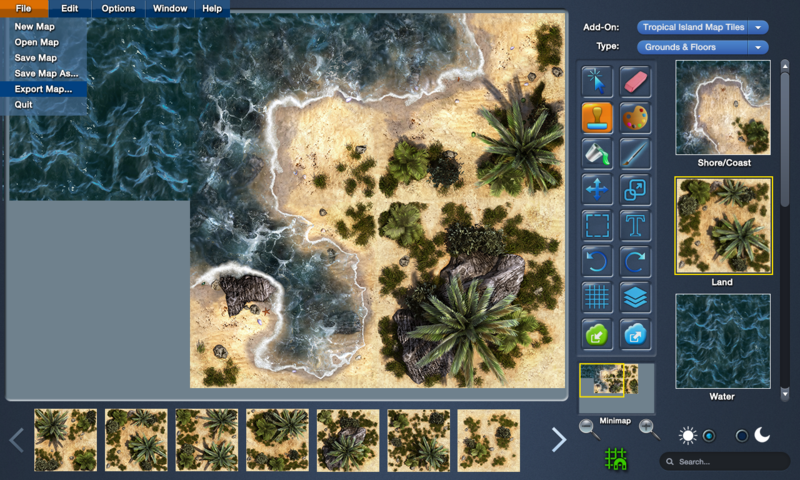 • Quickly assemble existing map tiles into a large map layout. • Support for layers (to adjust the stacking order of items on a map). • Group layers and show/hide/adjust the entire group as a whole (e.g., the contents of a given room), for greater project organization. • Randomization features for textures (to avoid repeating patterns) and for placed items (e.g. randomly scatter trees, automatically varying their size and rotation). • Adjust the location, scale, rotation and opacity of any placed item. • Toggle between day & night versions with the click of a button. • Ability to mark media that should only appear on the GM version of a map (e.g. room key numbers, traps, secret doors, etc.). • Apply bitmap filters, for special effects such as Bevel, Glow, Drop Shadow, Stroke, Color Adjustment, Brightness/Contrast, etc. • Convenience of the MapForge Add-On format: The software knows how large each tile should be (in grid squares), where the exits are, what tiles can be placed next to it and connect properly, and makes it easy to find content via tags and keyword searches. • Export the entire map at once, or just the parts you want. I've spent a month and a half so far to get the program to the stage it's at in the downloadable prototype. I need to devote another 3-4 months to complete the program, and this Kickstarter campaign is intended to finance that development time, as well as the development of the various Add-Ons. I have an established track record developing virtual tabletop software for over a decade, with over a hundred releases to date. As a software developer, I have a reputation for being accessible, communicative, open to feedback and criticism, and prolific. I've always provided timely technical support to all users of my software. In short, I deliver, I'm in this for the long haul, I have an established reputation to uphold, and I'm passionate about my products. This project has a relatively short completion/delivery time (about 4 months for the software) because I will be able to re-use a fair amount of code from prior RPG-related software I’ve developed. This puts me in a unique position to deliver a robustly-featured program in a relatively short timeframe, and thus for a relatively low basic funding goal. I will be working on this project full-time. I expect the first release of MapForge (v1.0) to be ready sometime in July 2017. There will likely be a couple of alpha and beta releases in the months prior to that. Most of the content Add-Ons for MapForge should be released shortly thereafter (and in fairly quick succession), but there will definitely be at least a few Add-Ons available at the time of launch, since I'll need them for testing purposes, anyway. I will prioritize the production order of the Add-Ons based on how many people pledged for each one. The bulk of the money raised by this Kickstarter will pay for the development time that I have estimated it will take to complete the MapForge software and the Add-Ons that will be released for it. A very small part of the funds (a few hundred dollars) will cover necessary software upgrades and software license fees, another few hundred will pay for a nice, quiet place to work at a shared office, and a similar amount will be earmarked for advertising and marketing the final product. Social Media Goal: Any backer Sharing or re-Tweeting my campaign launch announcements and/or my Updates to this Kickstarter campaign on Facebook, Twitter, or Google+ will get early access to a Kickstarter-exclusive Add-On. To be eligible for this reward, you must be following Battlegrounds Games on either Facebook, Twitter, or Google+. In short, this campaign will finance the development of the MapForge software for a minimum of 4 months, working on it full-time (Edit: The funding achieved will now allow me to devote nearly a YEAR to MapForge and Add-On development!). I need your support to make MapForge happen. Help me create the most useful mapping program to visually enrich your RPG game sessions while reducing your prep time. GMs already have plenty of work they need to do to prepare for each game session. Making maps should not eat up most of that time. All rewards for this project are digital downloads, so shipping is neither a factor nor an added expense. Battlegrounds Games has over a decade of experience distributing software and content packs. If there should be a delay in delivery, it will most likely be related to completion of content Add-Ons. Should this occur, the program can easily be released with whichever Add-Ons have been completed to date, so that backers can start using the software right away, and any remaining Add-Ons can be delivered piecemeal as they are completed. Receive a MapForge license once the program is officially released (est. July 2017). Receive a MapForge license once the program is officially released (est. July 2017), and receive all 6 commercial Add-Ons that allow for publishing and/or commercial use (this includes all 4 of Steve Gaudreau's Add-Ons, plus Kepli's Tree Pack and Bogie's Instant Dungeon Dressing). Sold separately, these would have a combined value of $107.50. The Add-Ons are expected to be released in August. Receive a MapForge license once the program is officially released (est. July 2017), and receive a copy of every single commercial Add-On offered on the project page (some are for Personal Use Only, while others allow for publishing and commercial use, see the description of each Add-On for details). This pledge level gets you the software license for even less than the Early Bird rate.